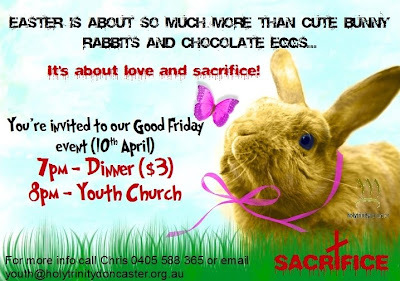 This was our flyer for our upcoming youth dinner and service on Good Friday. It comes at the end of Term 1 where we have been looking at sacrifice in our 7-10 youth group. I'm currently trying to work out what I'm going to say at this service. Prayer for God's guidance and wisdom for me would be excellent.